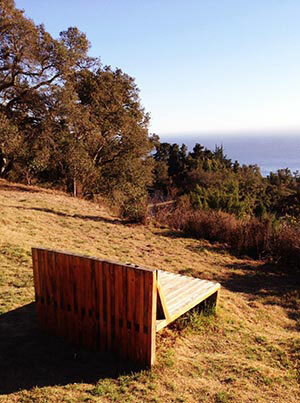 Tucked into the hillsides of the Santa Lucia Mountains, the Ventana Restaurant has arguably the best views on the entire southern Big Sur Coast, and is among the most well know of the big four restaurants in Big Sur. If you are traveling to Big Sur as a last minute escape, or for a well planned romantic anniversary celebration, the restaurant at Ventana is very likely to please. Here you can enjoy tantalizing cuisine that can be leisurely enjoyed while gazing at the 40 miles of the southern California Big Sur Coast from a huge terrace 1200 feet above the waters edge. The restaurant features a rustic lodge design with huge timbers, an open kitchen with walls of vintage wine selections, and abundant window seating with views of huge redwood trees and gnarled oaks that cover the hillsides of this 243 acre setting. 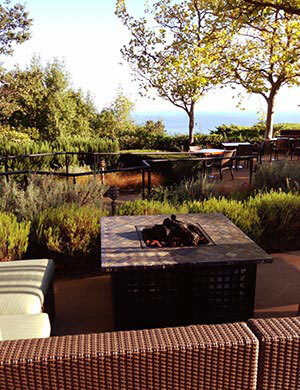 Views of the Pacific Ocean from the outside terrace are stunning, and the terrace is a perfect place to linger with a glass of wine or favorite beverage while planning your escape to new destinations in Big Sur. A large fireplace in the main seating area is a nice and welcomed necessity in the cooler months of the year. 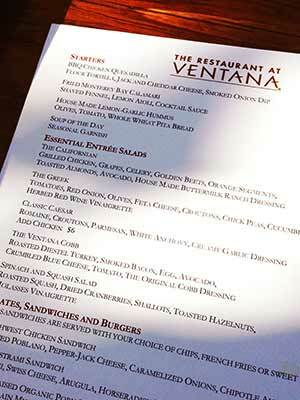 Is The Food At The Ventana Restaurant As Good As The View? The cuisine here is sourced locally and is primarily organic. A new chef in 2014 has changed the menu and the offerings appear more broad, although some of the vegetarian choices are absent from the previous menu. The restaurant is open for lunch and diner to the public and sunsets are spectacular. My recommendation is to come here for lunch unless this is a special occasion where a sunset dinner is on your agenda. Watch for specials that can be amazing offers.The smoked trout salad with rhubarb and asparagus is delicious but pricey at $17. For dinner the Chefs Four Course Meal at $75 is worthy of your consideration. I spotted swordfish, wild boar, fettuccine and vanilla brûlée on the menu. The prices for lunch are so much better than those on the dinner menu and of course, the views are the same. It seems that the service here is sometimes spotty and best before the throngs of visitors decend on Big Sur in the summer months. I have had been here several times in the late spring and early fall, and have always had a wonderful lunch and attentive service and never felt the pretentious attitude that you sometimes find in upscale restaurants. For me, the real value here is the tranquil, life adjusting attitude that is experienced after about an hour of taking in the panoramic views an munching on appetizers. As you travel south on the Big Sur Highway, watch for the village of Big Sur and the Signs that welcome you to Pfeiffer Big Sur State Park. Keep going until you see the big red barn on the left of the highway, and turn into the uphill drive that takes you towrad the Ventana Inn. You will see a parking area off to the right and the entrance to the restaurant.